‘Tis the season to indulge one’s sweet tooth! With that in mind, McGill’s Executive Chef, Oliver De Volpi and the pastry team at Bishop Mountain Hall have created what is sure to be an instant holiday classic. 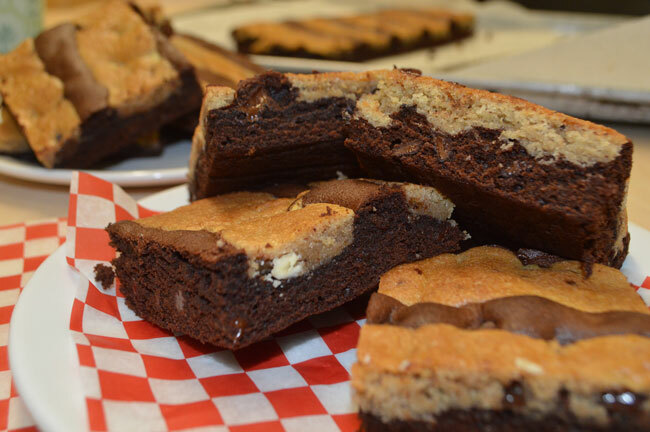 Behold the Holiday Fair Trade Crownie – the union of Student Housing and Hospitality’s exclusive Fair Trade brownie top with a chocolate chip cookie. Enjoy! Preheat oven to 350 °F. Grease a 9×12 cake pan. Line the bottom with parchment paper. Cream the butter and sugar together. Add all the other ingredients and mix only until smooth (10-20 seconds). Stir in chocolate chips. Pour in and layer the brownie recipe first and cover with the cookie recipe. Cook for approximately 35 minutes on until just firm to touch.